Your feet are what carry you through rough terrain and various weather conditions, and they should be protected with only the best quality products. Many hunters and hikers look for top-notch boots or other forms of footwear, but one item that is often overlooked are a good pair of socks. During a long hunting trip or hike, a quality pair of socks can really make a difference. What’s the Best Material for Hunting Socks? There are many different materials socks can be made of, and it’s important to choose a quality material that delivers. Below, we’ve listed a few of the most common materials that turn up in hunting socks. Wool is a great material for socks that may be worn in the winter. Unlike cotton, wool acts as an effective insulator, and is also able to absorb high amounts of moisture. Wool is also able to dry faster than cotton, and the material is also more odor-resistant and anti-bacterial than cotton. Wool socks tend to be quite thick, which is why Merino Wool is the perfect in-between for warmth without the added thickness. It is a temperature-regulating material that is itch-free and finer than regular wool. Cotton is an affordable material that is comfortable on the feet, but it is very water-absorbent, which can lead to uncomfortable and wet feet if worn for a long hunting trip or hike. If you do get cotton socks, it would be a good decision to choose a pair that has a low amount of cotton in it. An acrylic blend features synthetic acrylic fibers that are usually also blended with spandex and nylon. This material makes socks that are form-fitting and quite elastic. They make for very durable products that efficiently wick moisture and sweat away. The material isn’t very thick though, so these socks may not be the best to wear if you’re outdoors during the colder winter months. Hunting socks differ from your everyday socks because they are made to last in prolonged wear and tear in outdoor settings. There are a few things you should look for in a good pair of hunting socks, and we’ve listed a few to get you thinking. If you’re on your feet walking over rough terrain for hours on end, you’ll want a pair of shoes and socks that are durable and can last for many washes and wears. A durable pair should be able to hold up against extended wear, and shouldn’t be easily torn or worn down. The thermal and moisture wicking capabilities are important for a pair of socks, especially depending on the temperature they’re worn in. A pair that is worn in the winter should have thermal qualities by being able to keep your feet warm no matter how cold the temperature may be. You also want a product that is able to manage and regulate the moisture that is caused by sweating during long walking trips. If the moisture absorbs and stays in your socks, it will result in an uncomfortable experience. Socks will be on your feet all day, and it’s important to find a pair that are not only functional, but comfortable. Some come with added cushioning that allow them to be more comfortable, and the extra padding can also be beneficial for those that need arch support. With so many different types of hunting socks out there on the market, it may be difficult to find the ideal pair that would work best with the conditions planned for your hunting or hiking trip. Luckily for you, we’ve compiled a list of what we think are the best options that you could buy, whether you’re looking for a pair of waterproof socks or ones that are superior insulators. These hunting socks are made from Merino wool, nylon, and lycra spandex. This combination of materials allows them to be insulating, while also being able to wick away sweat and excess moisture. 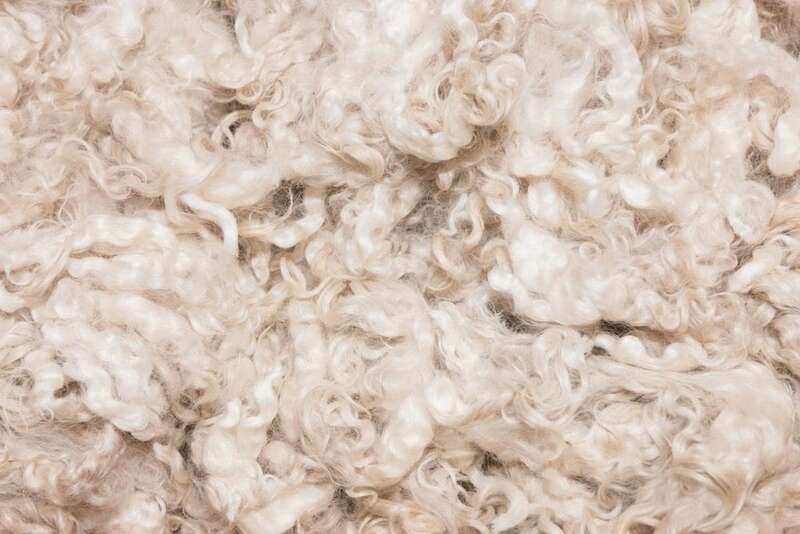 Merino wool is a superior material, as it is breathable and comfortable under various conditions. These are fast drying, able to pull moisture away from the skin, and they also are able to repel odor and bacteria. Not only do these provide a comfortable fit, but the quality ribbed material also works to prevent bunching, slipping, and blisters. There is a mid-level cushioned underfoot that provides ultra relief that helps you continue your trek without any discomfort. Overall, this is a great pair that provides a great fit and long wear time. They are a bit on the thin side, which can lead to easy wear and tear if a smaller size is worn than usual. The sizes also tend to run a tad bit small, so make sure to order up so they’ll fit properly. Other than that, they are quick-drying socks and are comfortable thanks to light underfoot cushioning. The material helps with wicking sweat away, while also repelling unwanted bacteria and odor. This is a good pair to add to your next hunting trip. These are made from a combination of wool, polyester, nylon, acrylic, and spandex. The wool-lined construction gives this sock a good amount of insulation, without being too stuffy. The mix of the other materials allows it to be fast drying and able to wick away sweat so your feet don’t become damp and uncomfortable while these are being worn. Antimicrobial technology allows them to fight unwanted bacteria and odors that develop while being worn. A cushioned sole and reinforced heel and toe add extra durability and coziness for a secure, clean fit. Since there is only a percentage of wool in the mix of materials, these aren’t bulky like 100 percent wool socks tend to be. They are warm, while also being breathable, so your feet won’t be uncomfortable with prolonged wear. These are worth investing in since they come as a set of two pairs for a fair price. They are made from a mix of materials, including wool and polyester, so they aren’t too bulky like traditional wool socks, but they still insulate well enough so your feet remain warm in colder conditions. If you wear them with a pair of tight-fitting shoes, they tend to come apart faster at the friction points. The material wicks away sweat so your feet don’t become uncomfortable and wet, and it also works to fight against unwanted bacteria and odor. These are made with an acrylic blend that works to protect against cold weather conditions, while also wicking away any excess sweat so your feet remain dry and comfortable. A long looped cushion pile helps this sock hold in more warm air than your traditional sock, making it a top-notch thermal product. The soft brushed inner fabric brings satisfaction to your feet for a great everyday wear. The interior makes for a cozy pair of winter socks, and provide a thicker layer. Colors to choose from include pink, purple stripes, and black. The acrylic blend allows for a comfortable stretch to fit feet of various sizes, and they are able to form to the shape of your foot. While these make for a very comfortable and cozy pair of winter socks, they may work better to be worn inside. The material is an acrylic blend, and while they form to fit well to your foot, they are a bit thick and wouldn’t be your first choice to provide insulating heat. The interior material is very soft and cozy, almost like fuzz, but it is not very good at insulating to keep your feet warm. They don’t cause your feet to sweat excessively, so they are quite breathable. That being said, though they are comfortable, this may not be the best pair to actively wear out on a hike or hunting trip. This pair may be better to wear indoors, and after a long hike to keep your feet comfortable in colder conditions. This pair is made from high quality and ultra soft yarn, and the thick material of these boot socks provide warmth and durability. The construction allows your feet to breathe, preventing them from becoming too hot so they stay at an adequate temperature. Moisture-wicking technology works to prevent moisture or perspiration from being trapped while worn, allowing your feet to stay dry and comfortable. A durable item, these are perfect for any rigorous outdoor activity, and they will protect your feet while also keeping them snug, dry, and warm. The over-the-calf length makes this a good pair to wear with taller boots, in order to provide warmth while also preventing chafing from direct skin to boot contact. This is a good pair to bring on your next outdoor adventure, especially if you tend to wear tall boots. These calf-high socks are made from soft yarn that both feels and looks great. Though they aren’t made with wool, they still do a good enough job of protecting and keeping your feet warm. They do not insulate as well as wool material does, but they are nice and thick, so make sure you have boots that are a bit larger to accommodate for these thicker socks. They are very cushioned and stretch perfectly to encase your feet and upper calf, without worry of them slipping down. A great addition to any outdoor explorer’s sock collection, especially for the colder months. 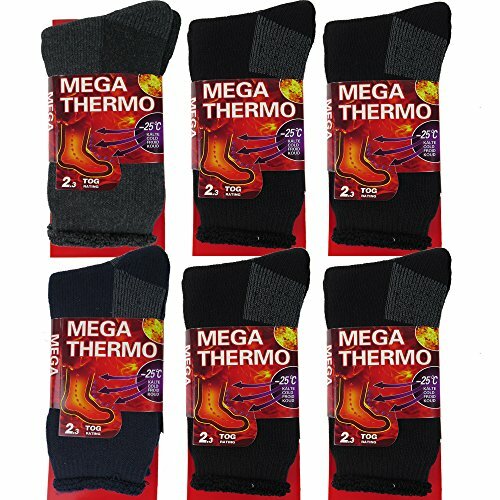 These thermal socks come in a pack of six pairs, making it a top choice for the money. They have superior insulation and are designed to hold heat seven times more than cotton versions, making them ideal for those colder winter months, whether you’re indoors or outdoors. The thermal compression socks not only provide optimal heat holding capabilities, but they’re comfortable, made with extra thick, soft fabric that is gentle on your feet and ankles so you’re guaranteed a great fit. Not only are they soft and warm, but they wick away sweat so your feet remain dry and comfortable, especially if worn for extended periods of time. This makes them great to wear on hikes or hunting trips, or just indoors if that’s what you plan to wear them for. Overall, this may be an option of hunting socks that stand out from the rest, since you get six pairs for a good price. They are made from a soft and thick material that is able to battle extremely cold temperatures to protect your feet and ankles to keep them warm and comfortable. These do tend to run large, so it would be wise to order a size or so smaller so they don’t slip down your ankles or bunch up at the toes. 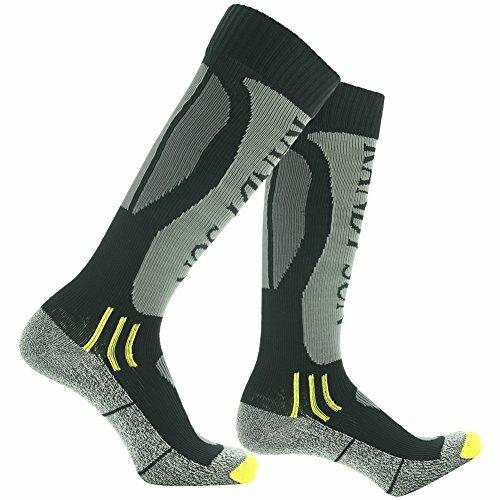 These durable compression thermal socks are perfect for hikes or any other outdoor activities where the weather is chilly and you need to bundle up, head to toe. These come in a variety of colors for your choosing and are composed of high waterproof nylon, polyester, and elastane. 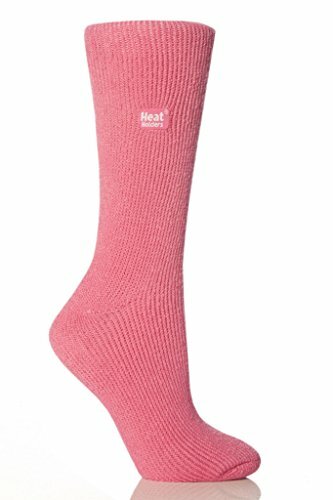 The lining of these socks is composed of CoolMax, polyester, and elastane. They are waterproof and seamless, able to protect your feet from harsh rain. The knee-high design, in addition to waterproof and weather protection, makes these a great pair to wear for any outdoor activities, especially if you need a good pair of boot socks. Insteps and an elasticated ankle offer a relaxing and proper fit and support during wear, and the multi-layer moisture-eliminating material keeps your feet dry in even the wettest conditions. As thick socks that hold firmly and comfortably to your feet while protecting them from the elements, these are worth investing in. These are the best waterproof socks you can invest in and the material is a neoprene synthetic blend. They offer protection from different weather conditions, and the taller fit makes them suitable for wearing with hunting or hiking boots. They stay relatively warm and breathable, so your feet won’t be sweaty and uncomfortable while these are worn. The material is a bit stiff at first, so you may want to wash them to soften it up for a better fit before wearing them right away. They may also fit tightly on the top, so make sure you look at the sizing and refer to measurements before purchasing. Made from cotton, polyester, Merino wool, and spandex, these socks feature an elastic closure and multiple colors and designs to choose from. You can also choose a pack of four, two, or you can just buy a single pair if you’d like. Extra padding located on the soles provide significantly more comfort and support than your average cotton socks, and they are warm and snug to provide a proper and snug daily fit. These provide compression and a reinforced heel and toe for extra support. The ribbed design gives extra stretch and elasticity, while also preventing them from becoming baggy and falling down. The Merino wool properties wick away excess sweat, provide anti-odor and anti-bacterial properties, and evaporate moisture rapidly for a smooth and relaxing fit, so your feet stay dry. 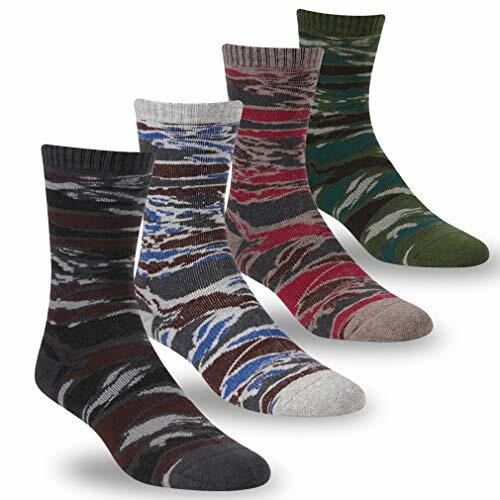 The thermal properties make these a great pair of socks to invest in and wear for those colder winter months, able to keep your feet warm and cozy while outdoors. This is a great pair to buy, for the price and the fit. The rib knit design gives these socks great elasticity while the elastic cuff works to prevent bunching and allows them to stay in the proper place. Multiple camo colors are offered, and you can choose to buy a single pair of these socks, or up to four pairs together if you really love them. The crew height makes them great for wearing with any hiking or hunting boots and protects not only your feet, but also your calf area. The anti-bacterial and odor repelling properties of the material help these stay clean and fresh, even with prolonged wear, so they won’t become uncomfortable or feel gross if you wear them for an extended amount of time. Coming in a pack of two pairs, these are thick and superior at trapping in heat, making them a great pair to take on hunting or hiking trips when the temperature drops. Additional padding makes these extra durable and makes them feel great and supportive on the feet. Aa heavily brushed fuzzy lining on the interior provides for a very cozy and soft experience. Ribbed detailing at the top of the sock prevents it from slipping down, so you won’t have to worry about constantly pulling your socks up. These are thick and provide great warmth, and are an excellent height to wear with boots to add extra protection. For two pairs of high-quality socks, these are worth investing in. Not only are they durable and thick, but they also have a cozy factor to them, with their fuzzy interior lining. They will feel great on your feet while also keeping them warm and protected from any chill if worn outdoors. The height of these socks makes them great to pair with boots. One thing to keep in mind is that these tend to run large, so order a size down. The elastic band at the top makes sure they don’t slip down, but they aren’t very strong and tend to stretch out. Other than that, these socks have no issues that make them any lower in quality. 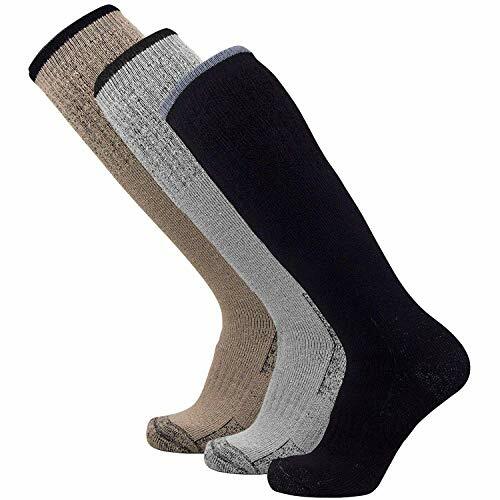 Made from eco-friendly recycled cotton, these boot socks come in a pack of four pairs, giving you a bang for your buck. The foot is fully lined and cushioned to help absorb the impact of your foot on the ground, making things easier for your feet. These provide warmth without being too thick, making them great to pair with some boots without having to squish your feet. They are durable and able to handle washes and extended wear, it will take a lot of wear and love before these socks begin to develop holes. 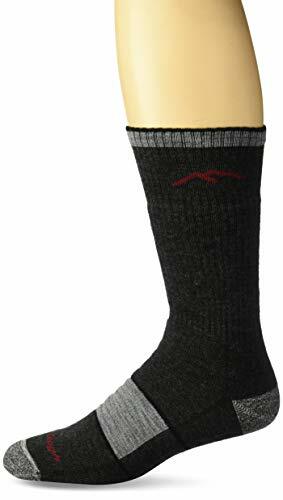 Overall, these socks come at a great price and you get four pairs for a relatively low price. They are made of a mix of polyester and cotton, though they are advertised as recycled cotton. 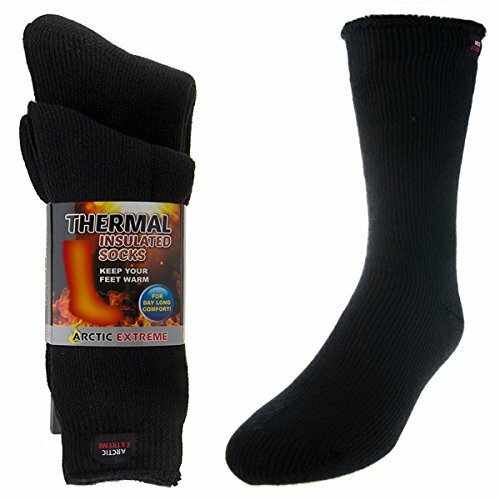 They are not really thermal socks, so they will not trap in heat as well as traditional thermal socks do. They aren’t as thick as wool versions but provide a decent amount of warmth. The cushioning on the foot adds to support your arches and absorbs the impact of your feet on the ground. 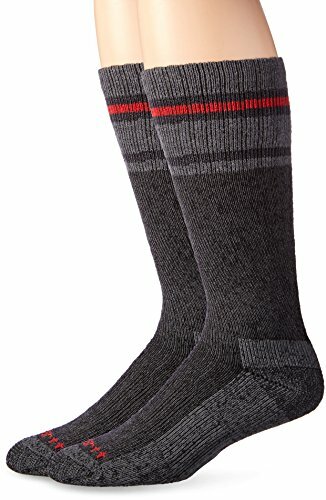 The height of these socks works really well with a pair of hunting or hiking boots. They may not be thermal socks, but they’re still a pretty good pair if you want a general pair to provide some type of warmth and extra padding to your feet. Hunting socks are great for protecting your feet and providing extra warmth, but some fall below others in quality and performance. There are qualities that make a hunting sock really great. You can buy any pair of socks, but if you really want to invest your money in a great pair, how long they last, counts. 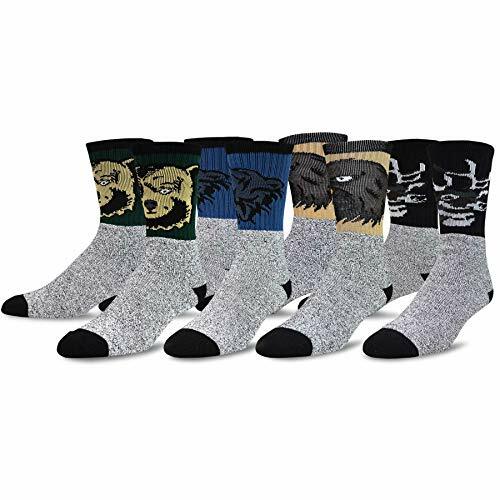 The best hunting socks will not only provide properties you may be looking for, such as thermal or waterproof properties, but they’ll also last through many wears and washes. You don’t want to have your socks develop holes after only a few wears, so make sure you look at the materials they’re made of and make sure the stitching is as durable as the material of the socks. During colder temperatures, keeping warm should apply to your whole body, feet included. You don’t want to have your feet feel numb while on a hiking or hunting trip, so it’s important to get a good pair of thermal socks. An excellent pair of hunting socks will provide great thermal properties, being able to keep your feet warm, while also being breathable so excess moisture doesn’t build up. Comfort is important for your feet, as they are what carry you across the terrain. A great pair of hunting socks will have added padding, either to the toes, heels, or the entire footbed. Some also include a fuzzy interior for extra coziness. You don’t only want your feet to be warm and protected, but you should also want to enjoy the feel of the socks you’re wearing. There are many different types of hunting socks out there, all with their own qualities. Have an idea of what sort of conditions you may wear these socks out in, and what you want to gain from investing in a pair of great hunting socks, whether it be comfort, thermal or waterproof abilities, price, or how long they’ll be able to last before you need to replace them. The best pair of hunting socks will meet all your requirements, and there’s certain to be a pair out there for you to take on your next trek outdoors.